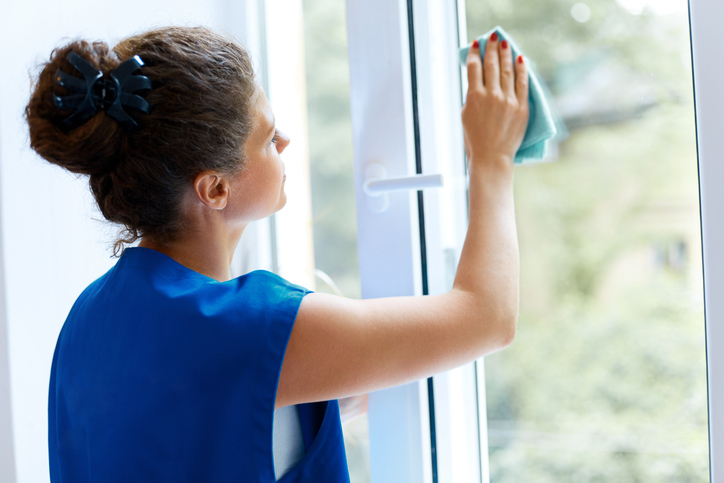 Cleaning windows is a way to make your home sparkle from the outside and enhances your view inside. While window cleaning may represent a time investment, it’s one that can pay off in big rewards when you enjoy crystal-clear panes this season. Use these tips to show off your windows to their best advantage. A common mistake homeowners make is solely cleaning the panes of the windows, ignoring the debris that tends to build up on windowsills and around the panes. Also, neglecting these areas can mean your cleaning cloth picks up unwanted dirt and gunk when you go to clean the panes. Start your window-cleaning endeavors by taking a small-handled brush, dustpan, and cloth-wrapped screwdriver by all your windows on the inside. Use the brush and dustpan to collect dirt, cobwebs, and all the debris that tend to build up on windows. The cloth-wrapped screwdriver is ideal for cleaning out stuck-on gunk or the inevitable dead insect you’ll come across. If you have protective screens between the outside and inside window panes, you can quickly clean them using a vacuum and brush attachment. Simply run the brush attachment over your screens to get them clean and keep dirt from rushing in your home if you choose to open up your windows this summer. The best day to clean your windows is a cloudy one. Cleaning on a sunny day causes streaking because the cleaner will evaporate too quickly. You’ll still be able to see potential signs of streaking on a cloudy day. You can choose from a number of cleaning tools based on what suits you best. Pre-moistened wipes are available or you can opt for a store-bought cleaner and microfiber towels. You can also make your own window cleaning solution using one-fourth cup of vinegar, one-half teaspoon of liquid soap, and two cups of water. Mix and pour into a spray bottle. If you have multi-pane windows, using a handheld sponge may work best. Try to keep the same cleaning pattern, such as left to right, then top to bottom. If desired, wipe clean with a squeegee. Finally, you can sit back and enjoy the beauty of well-cleaned windows!